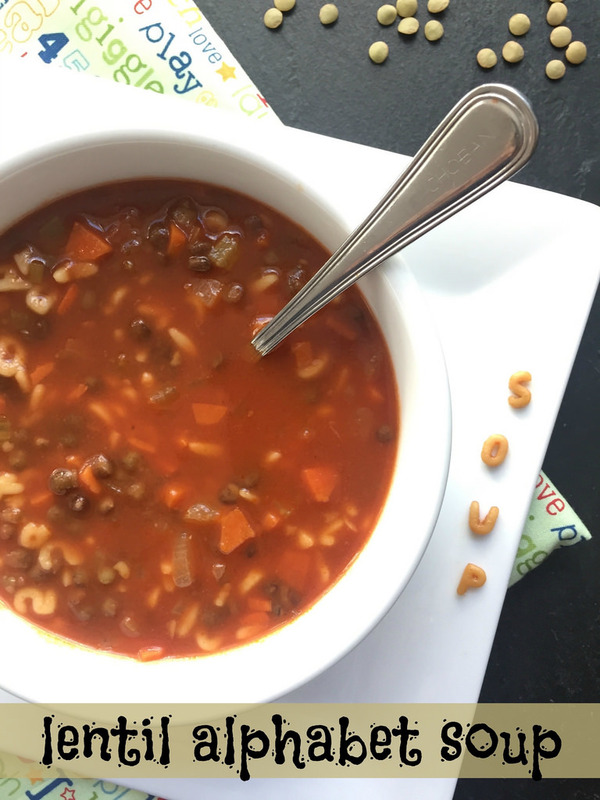 Vegetarian, vegan, and kid friendly, this Lentil Alphabet Soup is irresistible thanks to the playful pasta, and it’s filled with fiber and protein thanks to the lentils and vegetables. 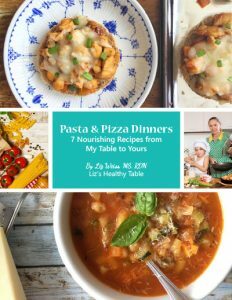 I have no doubt your kids will happily slurp up every last spoonful. 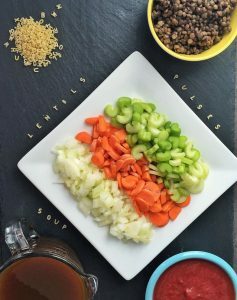 This one pot, savory soup is made with carrots, celery, lentils, and adorable alphabet pasta, and the veggies and lentils are so tiny, even the pickiest eaters at your table will love it. The UN General Assembly has declared 2016 the International Year of Pulses. Why? Because lentils, dry beans and peas, and chickpeas are a nutritious superfood, and they’re sustainable — they have a low carbon footprint and enrich the soil. Pulses are regarded as a food of the future, poised as a powerful solution for feeding the world’s growing population. 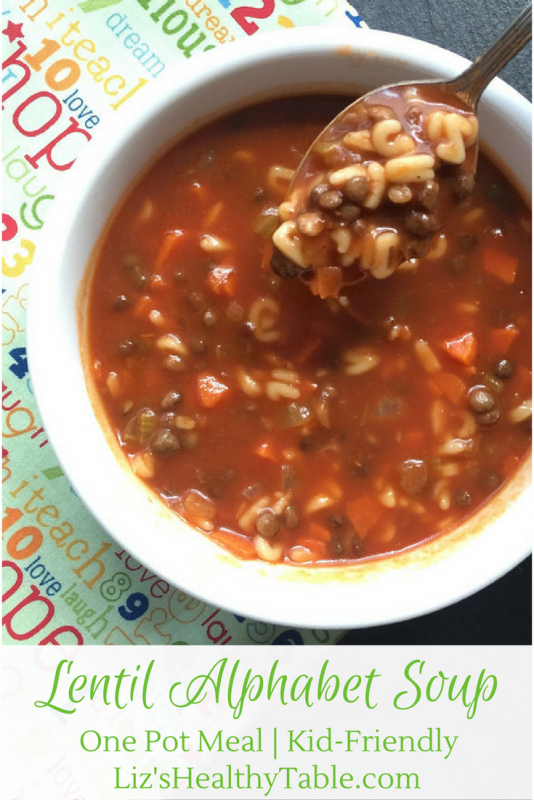 Did you know that one cup of lentils has 16 grams of fiber and 18 grams of protein? 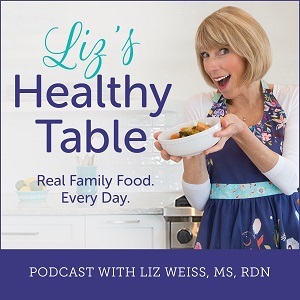 But wait, there’s more: One cup of cooked lentils has nearly 40% of your daily requirement for iron, and they’re also a good source of zinc, a mineral that strengthens the immune system. 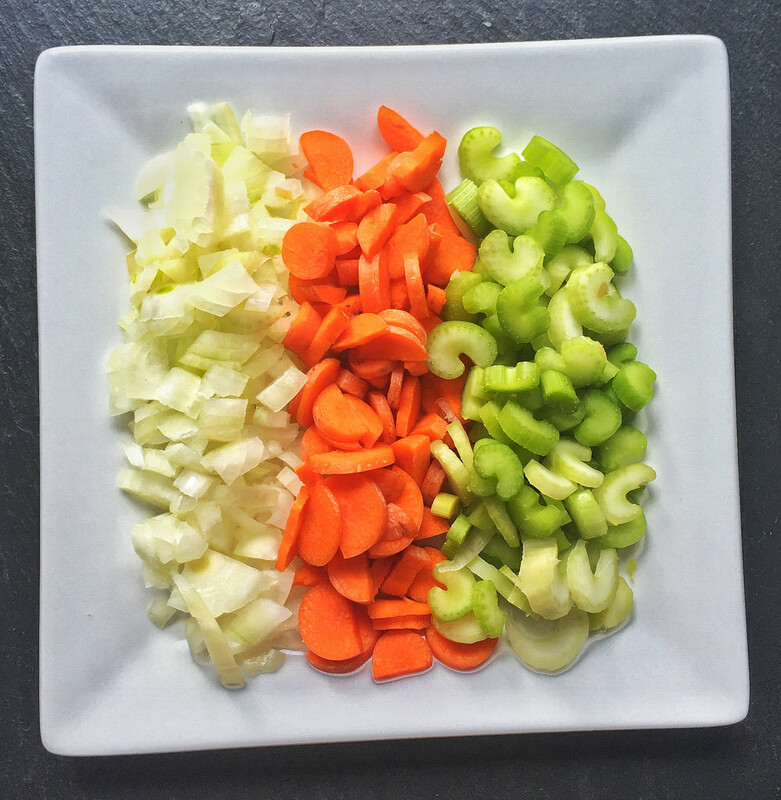 For my homemade alphabet soup, I chopped carrots, celery, and onions into tiny pieces. And I cooked them until tender. Once tender, I added a 32-ounce carton of vegetable broth, tomato sauce, and the alphabet pasta, and brought to a low boil. When the pasta was tender, I stirred in the cooked lentils. 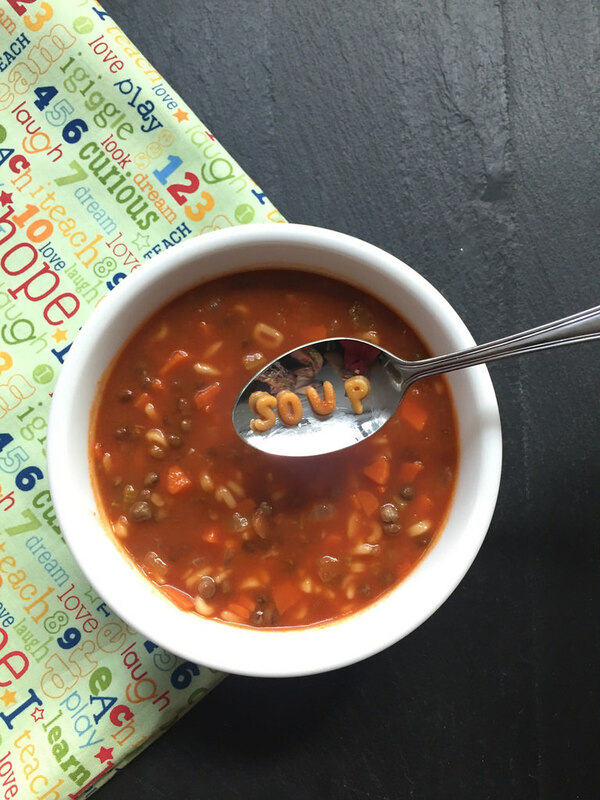 Picky Eater Tip: While the soup cooks, set out a bowl of the dried alphabet pasta and challenge your kids to spell out words … like their names! Lentils are easy to cook, but if you prefer the no-fuss route, look for canned or even frozen cooked lentils. 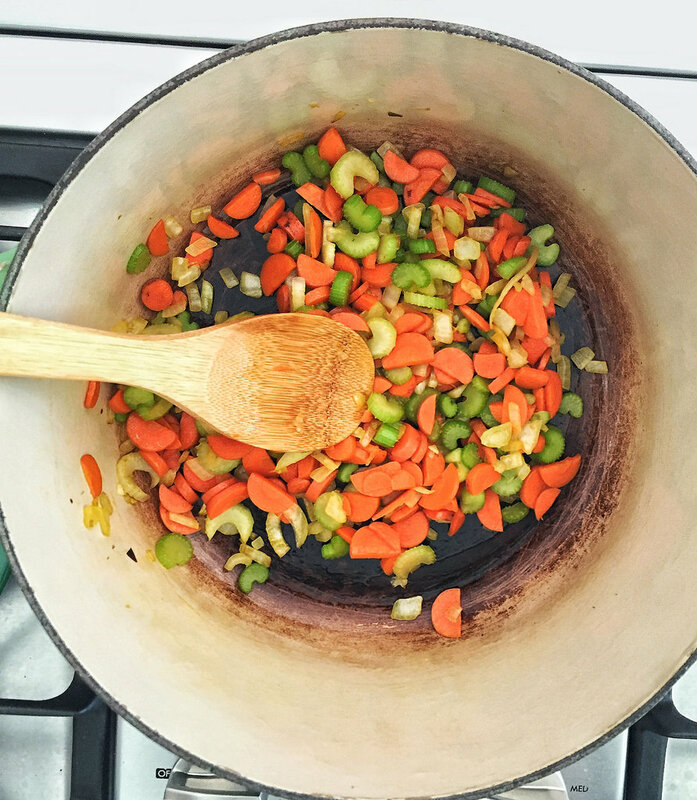 And speaking of cans, while you can easily find canned alphabet soup at the market, it tends to be super salty and barely has any vegetables, so I prefer making it from scratch with easy recipes like this one! Heat the oil in a dutch oven or large saucepan over medium heat. Add the onion, carrots, and celery and cook, stirring frequently, until tender, 10 to 12 minutes. 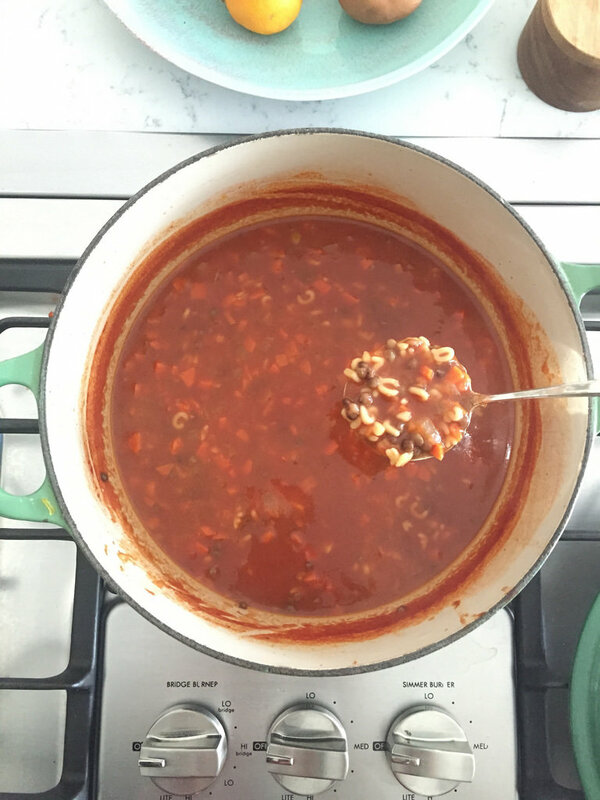 Add the broth and tomato sauce, increase the heat to high, cover, and bring to a boil. Remove the cover, stir in the pasta, and reduce the heat. Maintain at a low boil and cook, stirring frequently to prevent the pasta from sticking to the bottom of the pot, until the pasta is tender, about 20 minutes. Stir in the cooked lentils, and heat through, 1 to 2 minutes. 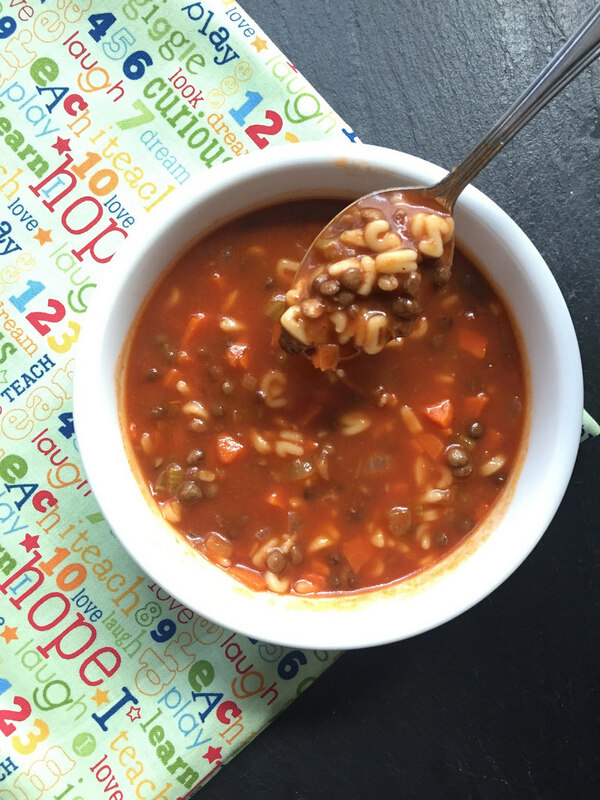 Each plant-powered bowl of our Lentil Alphabet Soup has 70% vitamin A, 20% vitamin C, and 15% iron. What are your favorite recipes using pulses? 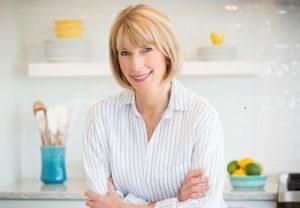 I added this to my February working mom meal plan! 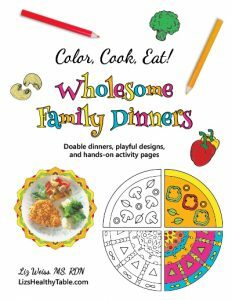 We hope you and the kiddos love it! It’s one of our most playful recipes yet! 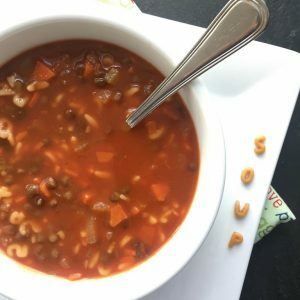 Can you use dried lentils, and cook them in the soup? It all the time for my girls. Do you have an adapted version for a slow cooker? Thanks! Gosh. We don’t. We tend to use the pre-cooked lentils (Trader Joe’s), but we’re sure it would be ideal for the slow cooker when starting with uncooked lentils. We will try it soon! Thanks! I use precooked lentils too, though anytime I can put everything in the slow cooker and not watch a pot is great. The girls are little and cooking can be a challenge 😉 Thanks for the other recipe. Looks delish!